I own a beautiful dress that I discovered is a bit more curve hugging than I usualy rock to work. Combined with its animal print, I haven't ever worn it to the office, and that's just silly! As you can see, it's not that hard to downplay the sexiness of a piece. 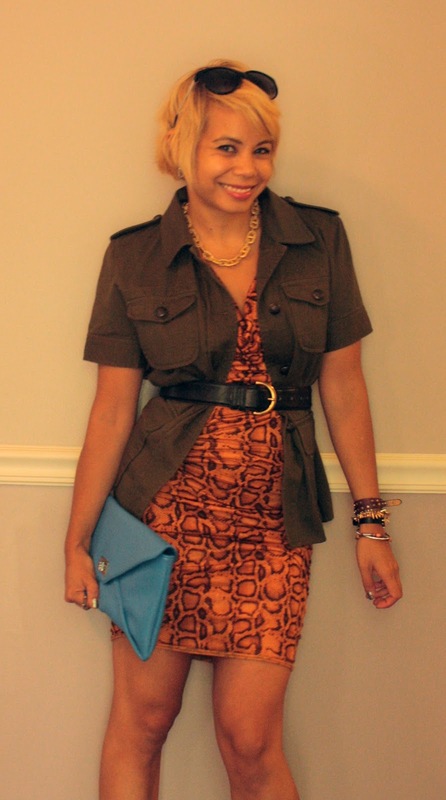 By simply pairing it with a masculine, military style blazer I completely changed the look of the dress! I know it seems obvious, but sometimes people just can't see what's right in front off them. I'm wearing: Rachel Rachel Roy dress, Ralph Lauren blazer, Juicy Couture sunnies, Coach belt, South clutch from a fashion show giftbag, Michael Kors sandals. Jewelry includes: C. Wonder necklace, Banana Republic wrap bracelet, vintage Gucci watch, spike bracelet courtesy of Stella & Dot. I went out for DC Restaurant Week after work with my girlfriends. I so must recommend 2941 for fine dining in the Northern Virginia area! Check out my delicious dessert!